Machu Picchu is an extraordinary place, beautiful and majestic. The Inka city built on the top of a mountain, a beautiful masterpiece of architecture and engineering. Machu Picchu is a sacred sanctuary full of mystery and hidden wisdom. The extraordinary architectural work done on the stone is a source of perplexity, amazement and admiration, its temples and enclosures are built in such a way that its structures are in complete harmony with the mountain and nature. The historic Sanctuary of Machu Picchu is considered a World Heritage Site. This 6-day retreat is an excellent opportunity to initiate an inner journey of healing, cleansing and purification; a journey of exploration of your inner world and the spiritual dimension. In addition, thanks to this retreat, you can visit the most important Inca temple, the wonderful sacred Machu Picchu, a mystical and mysterious place, part of an ancient civilization of wisdom. In this retreat you will participate in two Ayahuasca sessions, 1 San Pedro ceremony, and 1 offering ritual to Mother Earth (Pachamama) and 1 Healing Sounds Session. Our Ayahuasca retreats include the use of a sophisticated blinking light device that helps the brain experience visionary states and other states of consciousness. It is a device that stimulates the pineal gland and the production of endogenous DMT, generating variations in brain wave activity. Pandora Star Hypnagogic Light stimulates the pineal gland and the production of endogenous dimethyltryptamine (DMT). It is known that the pineal gland is able to detect light even with closed eyes; in addition, this gland produces DMT at the moment of dreaming, when we are in a state of meditation, or in experience of amplified states of consciousness, and also in moments of great happiness. The pineal gland is known as the third eye, or the psychic eye. The sessions with Pandora Star light sensitize our organism and allow a better assimilation of Ayahuasca medicine. San Pedro cactus ceremony is complementary to the Ayahuasca experience, although it is significantly different. The experience with San Pedro is during the day, and essentially it is a journey of deep introspection and broadening of consciousness. During this experience we will go to a Sacred mountain and we will visit a sacred andean place. The experience is accompanied by a session with Sound Healing. Participate in 2 Ayahuasca ceremonies in a retreat house, close to a sacred mountain in the Sacred Valley of the Incas. In the house there is a space specially designed for the ayahuasca ceremonies, which is a quiet place ideal for the ceremony. Participate in a San Pedro ceremony, which includes an ancient and traditional ceremony of offering to the mother earth, this ceremony is known as "Despacho", and it is guided by an Andean priest of Q'eros. During the experience with San Pedro we will visit a natural environment, near the river, where it will be possible to connect with the nature of the environment and your inner side. Participate in a Healing Sound Session during the San Pedro ceremony. 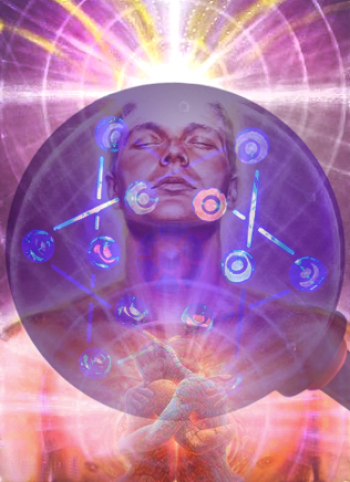 Participate in a session of Pandora Star hipnagogic light, it is a flickering light which stimulates your pineal gland to produce DMT to help you to experience inner visions and non ordinary states of consciousness. Participate in Reintegration Therapies and re-elaboration of the contents of the experiences. The next day, after each ceremony, there is a personal and private conversation to discuss the contents emerged during the ceremony with the intention of finding a way to integrate the process into daily life. A visit to the Inka temple of Machu Picchu. Includes entrance ticket and a private guide during the whole visit to Machu Picchu. A vehicle will take you from our house to the train station and from there you will travel in a train with a panoramic view of all the landscapes towards Machu Picchu. The visit to Machu Picchu includes a lunch after visiting Machu Picchu in a restaurant in “Aguas Calientes”. Bus ticket to the Machu Picchu sanctuary (round trip) and the whole tour will be with the company of a private guide. Special foods for each day of the retreat. The food is vegan, with organic vegetables. All meals are prepared according to the diet and use of teacher plants. Accommodation during the days of retreat in a Retreat House in comfortable rooms with private bathroom and hot water. Private mobility on the first day of the retreat from Cusco to the retreat house and the last day of the retreat back to Cusco. The first day of the retreat we will coordinate with a private vehicle to pick you up from your accommodation in Cusco and take you to our retreat house. The last day of the retreat there will be transportation to take you back to Cusco. Fees associated with money transfers for the payment of reservations. All the necessary clothes for the days of retreat. There is no laundry service. 4:30 pm: To arrive to the retreat centre in the Sacred Valley of the Incas. 4:00 pm: A session with Pandora Star hipnagogic light machine. 6:00 pm: To close the San Pedro ceremony. 4:00 pm: Train to Ollantaytambo and the to be picked up to go to the retreat house. 9:00 am: Special conversation to close the retreat and to give the personal diet and information to work in the reintegration of the experiences with the medicine.